Stunning Remodel by Dallas Architect and Artist just 15 minutes from Downtown Dallas. Impeccably Renovated for a more Contemporary, Open feel featuring clean lines and natural light, while balancing its 1950s Mid-century Ranch charm. New Kitchen with Wood Cabinets, Quartz Countertops and Stainless Steel appliances. Master Bathroom has Custom Vanity with Dual sinks, Dual Glass Front Cabinetry and Marble tile floors. 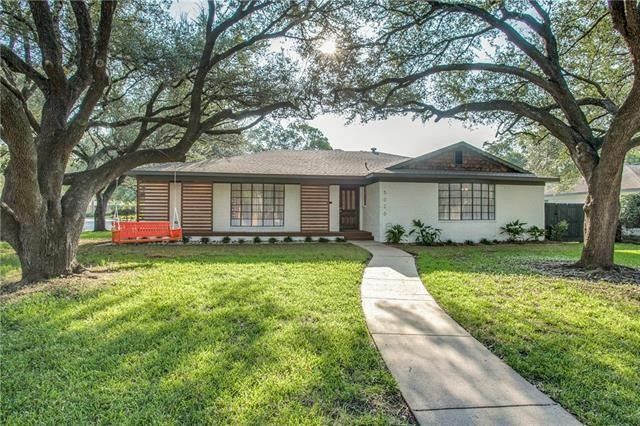 Home also features Eco-Friendly, Natural Hardwood Bamboo Floors in living, dining and kitchen areas, plush new carpet in bedrooms, Majestic Live Oaks, Large Corner Lot and Big Covered Patio. Garage has huge 9 x 22 storage room with electric that would make a great workshop, artist studio or gym. Directions: From I-30E exit Lawnview Ave (50A) and take Samuell Blvd. Turn right on Hunnicut Rd, left on Everglade, then left on Colter.